The Gelco GSeat is designed for anyone who has ever found their chair, plane seat, stadium seat or any other seat uncomfortable. The GSeat combines the cushioning features of memory foam with the weight-dispersing capabilities of gel, creating a seating solution designed to improve comfort during extended sitting. The GSeat Classic features a higher percentage of gel than the GSeat, resulting in a "firmer" but still cushioned feeling. The GSeat Ultra has the greatest percentage of gel, is thicker and also has a larger surface. The 5° degree wedge design of the GSeat elevates the hips to improve posture and can assist in relieving pressure on the back of the thigh above the knees. A "relief groove" running down the middle of the GSeat serves to reduce potential tailbone pressure and air vents assist in reducing heat buildup on the thighs. For convenience the GSeat folds in half for easy access to its integrated carrying handle, enabling it to easily be carried for travel or entertainment. 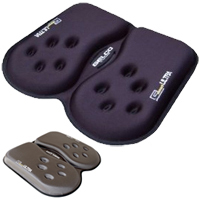 The Lycra cover permits users to easily shift position while the gripping underside remains fixed on the seat. The sealed design ensures that the support does not break down with use. The GSeat is available in two sizes, the GSeat for those with smaller build and the GSeat Ultra for larger individuals. The GSeat does NOT contain latex.